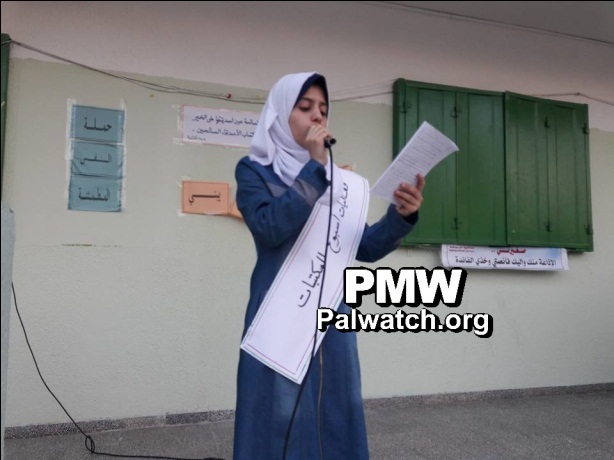 Read PMW's report on Palestinian Authority schools named after terrorists and Nazi collaborators‎ here. Lastly, many schools are named after Israeli cities. The PA frequently presents Israeli ‎cities as if they are Palestinian cities. Tal Al-Rabia is the Palestinians’ Arabic translation of Tel Aviv, to wrongly imply the existence of an Arab village of that name prior to Tel Aviv. 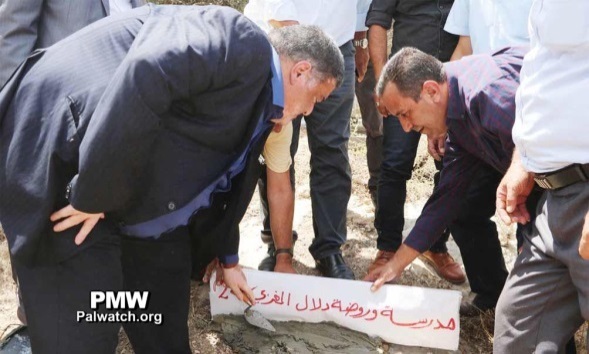 “Yesterday [Aug. 26, 2018], Mayor of Beit Awwa Younes Freijat and Director of the Southern Hebron Education Directorate (i.e., branch of the PA Ministry of Education) Khaled Abu Sharar laid the cornerstone for the construction of The Second Dalal Mughrabi Republic School (i.e., terrorist who led murder of 37, 12 of them children) in Beit Awwa with official and popular attendance by a group of the municipality's school principals and teachers. 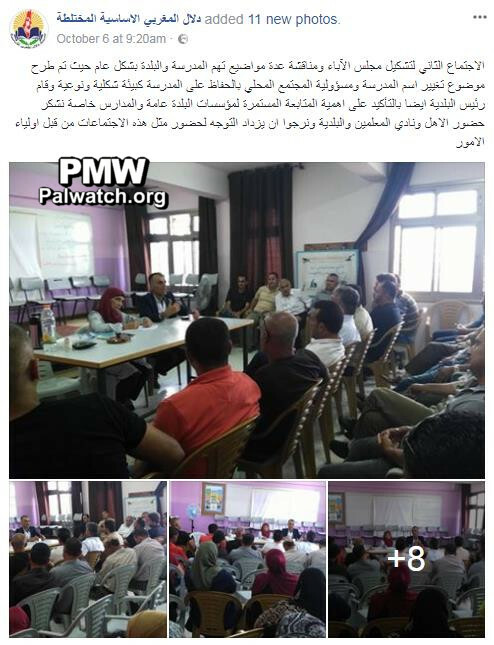 The event was held in the presence of Fatah Branch Secretary in Southern Hebron Yasser Doudin, Commander of [PA] Intelligence in Dura Colonel Saed Al-Kamel, and the Teachers and Pensioners Club. Freijat explained that the Beit Awwa Municipality is in need of new schools and that this school will be funded from the state coffers... It should be noted that the Dalal Mughrabi School’s name was changed to The Belgian School – Tala’ei Al-Janoub in honor of the Belgium government that built it..."
Martyr Dalal Mughrabi Elementary School for Girls "
The name of the Facebook page has not been changed even though the school was officially renamed The Belgian School – Tala’ei Al-Janoub instead of the Dalal Mughrabi Coed School in August 2018. 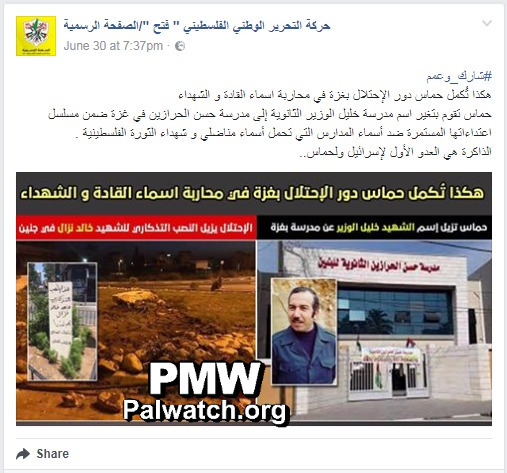 The Facebook page still features the name of terrorist Dalal Mughrabi, who led the murder of 37, 12 of them children. The school's new logo (above right) contains the PA map of "Palestine" that presents all of Israel as "Palestine" together with the PA areas, covered by a Palestinian flag, an open book at the bottom of the map, and to its right, a face with a keffiya (Arab headdress) around it. At the top is the new name of the school: "The Belgian School – Tala’ei Al-Janoub." 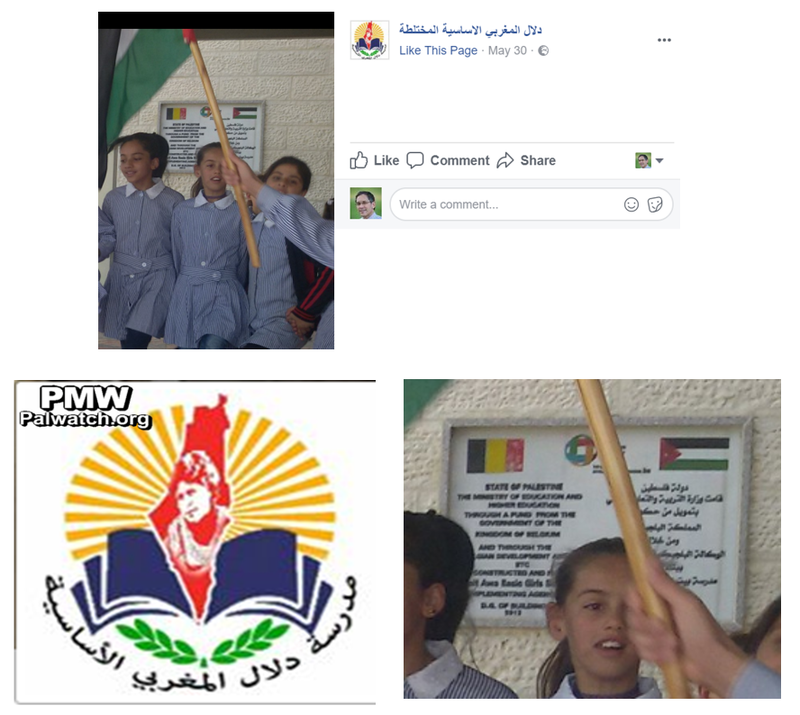 The school's previous logo (above left), containing a picture of terrorist Dalal Mughrabi, still appears in the photo album associated with the Facebook page as of Aug. 29, 2018. Headline: "The [PA] Ministry of Education and the Accountability for Violence Against Children Association completed [the project] For a Secure Palestinian Childhood"
"[PA Minister of Education and Higher Education and Fatah Central Committee Deputy Secretary Sabri] Saidam emphasized the significance of this project, which is taking place at the same time as the incessant Israeli attack against [Palestinian] education in general, and against the Palestinian curricula in particular. He emphasized that the one that should be held responsible is the occupation, which has murdered hundreds of children and students… Yesterday, the Ministry of Education and Higher Education… [also] honored a group of male and female principals of schools that take initiative and excel, with the participation of Minister of Education and Higher Education Sabri Saidam… Saidam spoke about the brutal incitement campaign that the occupation is leading against the education sector, and particularly about the targeting of the Palestinian curricula. He noted the pressures that the occupation is attempting to exert on the donors, especially in the matter of changing the names of the [PA] schools." 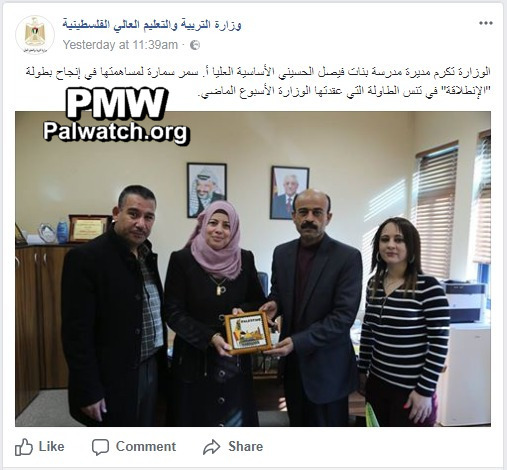 The image shows the principal being presented with an honorary plaque featuring the PA map of “Palestine” that presents all of Israel as “Palestine” together with the PA areas. The word “Palestine” is written in English on the plaque, and it likewise shows the Palestinian flag, the Dome of the Rock, and the Al-Aqsa Mosque. Faisal Al-Husseini who the school is named after was a senior Fatah and PLO terror leader in the 1970s. constructed and furnished, Beit Awaa Basic Girls School"
The first screenshot shows the school logo in the profile photo of the school’s Facebook page and the plaque from Belgium. 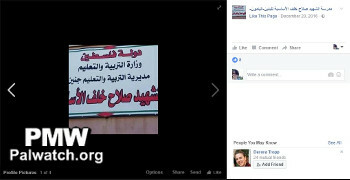 Below it on the left is the school logo enlarged showing the face of terrorist Mughrabi and the text: "The Dalal Mughrabi Elementary School." To the right of it enlarged is the plaque about Belgium’s funding. Note: PMW exposed that the Dalal Mughrabi Beit Awwa Elementary School was funded by Belgium. Following PMW's report, Belgium announced that it was temporarily halting all contruction projects with PA schools. Text and images posted on the Facebook page of the Dalal Mugrabi Beit Awwa Elementary School. The pictures show the meeting that was convened at the Dalal Mugrabi Beit Awwa Elementary School, named after terrorist Dalal Mughrabi who led the murder of 37, 12 of them children. Posted text: "The second meeting [that was convened] in order to assemble the parents' committee and discuss several topics regarding the school and the town in general. During [the meeting], the matter of changing the school's name was raised." Posted text: "Good morning from the Dalal Mughrabi School, from the name that glitters full of love to all of the children of Palestine, to its elderly, to its young, and to all the Martyrs (Shahids) of the homeland. The name Dalal will remain engraved in our hearts and minds." 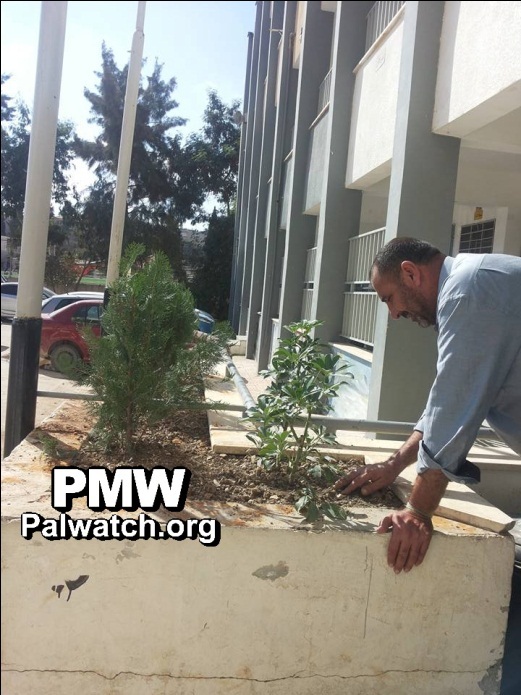 PMW exposed that the Dalal Mughrabi Beit Awwa Elementary School was funded by Belgium. Following PMW's report, Belgium announced that it was temporarily halting all contruction projects with PA schools. "Following the expropriation of the right and will of the Palestinian people to name its institutions, and following the decision to change the name of the Dalal Mughrabi School to another name, the honorable homeroom teacher Maysoun Al-Sweit wrote a poem that expresses the degree of sadness that affected all of the residents of the region, and especially the educational staff and students of the school ?? 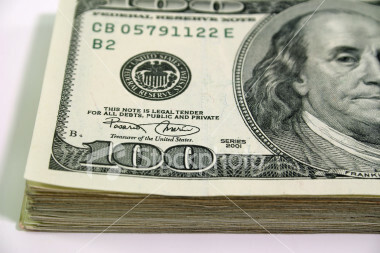 Hold on and ask Allah for help." 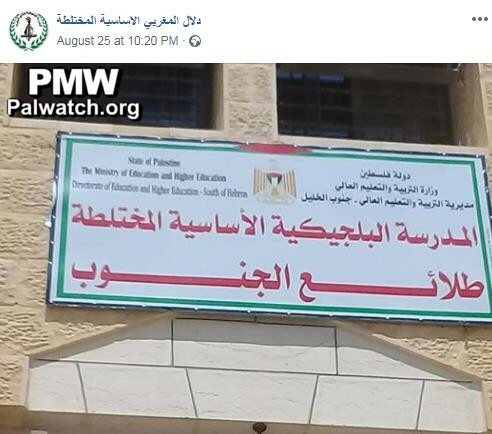 Hamas changed the name of Khalil Al-Wazir [Abu Jihad] High School in Gaza (i.e., terrorist, responsible for murder of 125) to Hassan Al-Harazin School (apparently a private donor to the school –Ed. 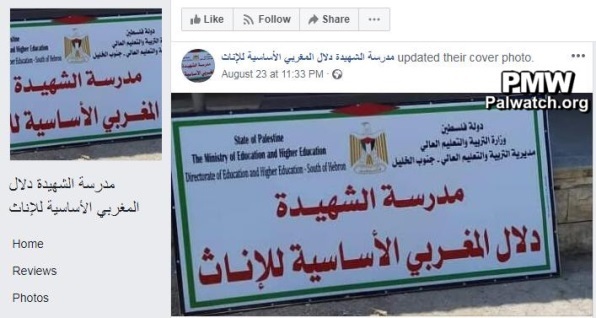 ), as part of its chain of ongoing attacks on the schools bearing the names of the fighters and Martyrs of the Palestinian revolution (i.e., from Fatah). Salah Khalaf (Abu Iyad) - One of the founders of Fatah and head of the terror organization Black September. Attacks he planned include the murder of 11 Israeli athletes at the Munich Olympics (Sept. 5, 1972) and the murder of two American diplomats in Sudan (March 1, 1973). It is commonly assumed that his assassin, a former Fatah bodyguard, was sent by the Abu Nidal Organization, a rival Palestinian faction. Abdullah Azzam - Palestinian co-founder of the Al-Qaeda terrorist organization and the Lashkar-e-Taiba terrorist organization in Pakistan. Azzam was a proponent of global Jihad and the establishment of an Islamic state. Azzam fled the West Bank in 1967 and reached Saudi Arabia in the 1970s, where he taught Osama bin Laden at King Abdul Aziz University. In 1979 Azzam moved to northern Pakistan where he took an active role leading the fight against the Soviet Union in Afghanistan, enlisting bin Laden in the effort as well. Azzam intended to attack Israel and Europe after the Soviet-Afghan War. It remains unclear who was responsible for Azzam's assassination with a bomb in Peshawar, Pakistan, on Nov. 24, 1989. Picture posted on the Facebook page of the Martyr Abu Jihad High School for Boys. The picture shows the Martyr Abu Jihad High School in Jenin, the West Bank. Picture posted on the website of Fatah’s Prisoners’ and Released Prisoners’ Commission in the Gaza Strip. The picture shows girls at the Salah Khalaf Junior High School in Gaza. Abu Iyad (Salah Khalaf) - Founder of Fatah and head of the terrorist organization Black September. Attacks he planned included the murder of 11 Israeli athletes at the Munich Olympics (Sept. 5, 1972) and the murder of two American diplomats in Sudan (March 1, 1973). The picture shows a girl speaking at the Salah Khalaf Elementary School for Girls in Gaza. Headline: "Tulkarem District Governor lays the cornerstone of the first stage of the school named after Martyr Salah Khalaf"
Abu Bakr emphasized the importance of the project of the construction of the school named after Martyr Salah Khalaf, in order to commemorate the memory of this great national fighter."